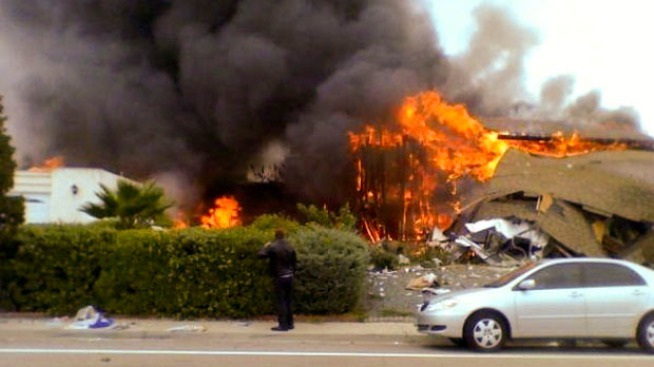 A Navy jet crashes in a residential neighborhood, destroying one home and damaging another. Military officials now say three civilians are confirmed dead after an F/A-18 Hornet crashed in San Diego on Monday. Investigators removed two body bags from the scene just after 4 p.m. The Navy jet crashed into a residential neighborhood, destroying three homes and damaging others. The pilot was able to eject and parachuted into a nearby canyon. Watch home video of crash scene. Shortly before 3 p.m. at a news conference, San Diego Mayor Jerry Sanders and a military official both sent out their condolences to the family of the victims. Their identities have not yet been released. Officials said that four people were thought to be in the house. One person is still missing. The plane went down in University City near Interstate 805 at about noon P.T. Aerials of the crash scene show debris in the street and most of one home destroyed. The smoke is so thick at the corner of Huggins Street and Cather Avenue that it's making it difficult to breathe, prompting some homeowners to voluntarily evacuate the area. There may be additional health threats as well, and hazmat teams are on the scene, assessing cleanup efforts. The F/A-18 was from nearby Marine Corps Air Station Miramar, taking part in a squadron training mission. The squadron has both Marine and Navy pilots in it. The jet crashed shortly before noon as it prepared to land at Marine Corps Air Station Miramar. The crash occurred 2 miles from the base, Federal Aviation Administration spokesman Ian Gregor said. Debris from the aircraft is strewn around the neighborhood. One of the jet's engines is in the street, a charred mess. According to San Diego Police, you are advised not to touch any fallen debris as it could be hazardous. Call (858) 577-1727 to report the debris to MCAS Miramar. Witnesses in the area saw the pilot eject from the plane. He landed in a nearby tree. The pilot was taken to Balboa Naval Hospital after the accident. Local fire officials said there was only one person aboard the aircraft. See photos and learn more about the pilot. Another witness, Vern Larson, said he was doing some Christmas decorating when he heard the crash and then saw the parachute descend into a canyon and out of sight. Larson jumped in his car and drove down to the crash site. "I found the parachute, but there was no one in the parachute," Larson said. He said someone from MCAS Miramar inspected the chute as well but there was no one in the area. Larson said he ran into one home near the crash that was about to burn and checked the rooms to make sure no one was there. A lot of people described it as a loud explosion and thought some construction equipment was dropped. Read article on witness reaction. “The plane was going slow but the engine was running,” said one witness, Gil Johnston who lives 2 miles west of the crash scene. “Then I heard a pop." A Miramar spokeswoman said personnel from the base were dispatched to the crash site. Miramar, well known for its role in the movie "Top Gun," is home to some 10,000 Marines. It was operated by the U.S. Navy until 1996. According to the North County Times, there have been previous crashes involved F-18's in San Diego County. A woman who answered the phone at nearby University City High School, who would not give her name, said the school near the crash site was in lockdown, meaning students are restricted to their classrooms. Watch home video from the crash scene: Part I and Part II.